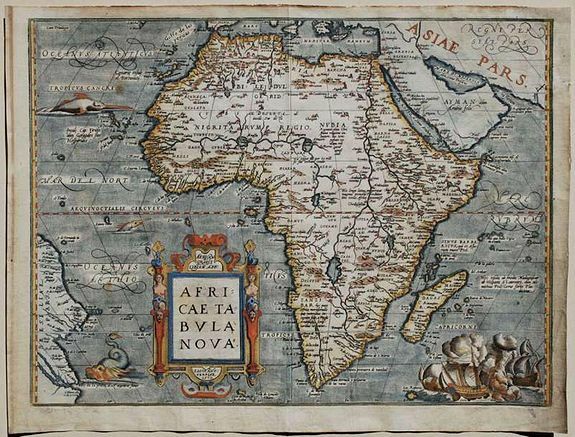 Old map by ORTELIUS -Africae Tabula Nova. Size: 19.5 x 14.8 inches. Condition: There has been a repair of a split corner and there are a couple of small repaired tears to the margin that do not affect the image area. From the atlas 'Theatrum Orbis Terrarum'. A striking continental map designed by Ortelius from elements of contemporary maps by Gastaldi, Mercator, and Forlani. It is considered a cornerstone map for African collections. Gastaldi shows ‘P.a de Cayneca’ on his 1564 map which Ortelius copied in the same geographical location as ‘Punta de Caineca’. As a curiosity ‘Zanzibar’ appearing in South-West Africa (not on the west coast as Tooley and Norwich stipulate. It is also a misconception that the name 'Carneca' appears for the first time. - See Wulf Bodenstein in Ortelius’ Maps of Africa in : Van den Broecke et alia (eds. 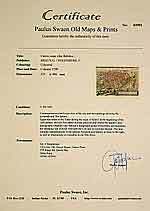 ), Abraham Ortelius and the First Atlas, HES, 1998, p. 194. The Nile is based on the Ptolemaic concept. The map is decorated with a strap work title cartouche, a grand sea battle, swordfish and a whale. There is no sign of the so-called ghost-like sea monster off the coast of Arabia. Reference: Broecke 8, Norwich Maps of Africa 10..